Recently I had the pleasure of re-visiting one of my favourite hangouts. I was a frequent customer of the Fox and Fiddle location at John St. and Richmond St. in Toronto, years ago. After moving around a lot, I’m back in Toronto for good, and got to check out the location at 27 Wellesley St. E, in Toronto. I had never been to this Fox and Fiddle location, and I was surprised by how big it was! There are three floors, all with TV’s and/or projection screens that show all the biggest games and pay-per-view events. Want to know the best part? There is no cover charge to get in! So you and your friends can go in and watch the next UFC fight in a fun environment on a big screen! This specific location also offers karaoke nights Thursday thru Saturday! 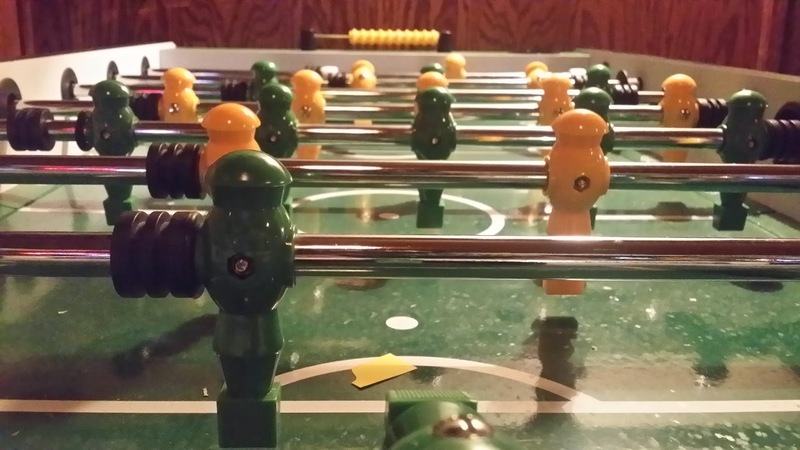 Bonus: not only do they have a heated patio, but also a fooze-ball table. I challenge ANYONE to a fooze-ball game! Bring it! 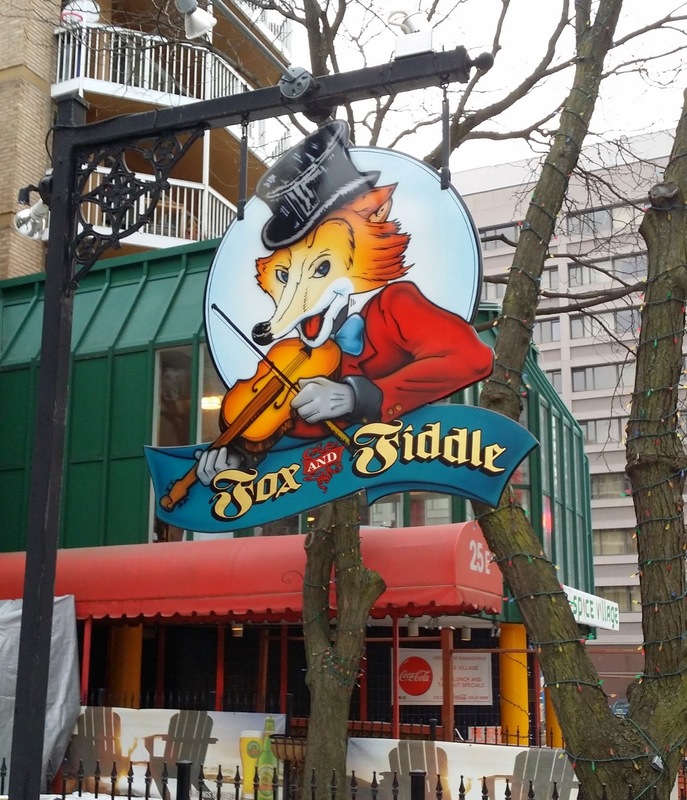 Any time I have been to a Fox and Fiddle, I have always had a great experience, and this time was no exception. Walking in, we were instantly greeted with a friendly staff member who showed us to a table and gave us menus. The Fox and Fiddle menus have been recently revamped, and there are SO many options! Going to a pub like Fox and Fiddle, some would expect simple pub staples to overwhelm the menu, but there are some new additions that you would not expect! The menu consists of old pud favourites, with new twists! From Potstickers (dumplings stuffed with sesame jack cheese, chicken and vegetables served with an amazing Asian sesame dip) to a Butter Chicken Poutine (pub chips covered with our butter chicken sauce topped with melted cheese curds and fresh cilantro) to Chipotle Chicken Wrap (breaded crispy chicken strips, lettuce, scallions and melted marble cheese tossed in an ancho-chipotle sauce wrapped in a soft tortilla) or even the Pulled Pork Flatbread (stone baked flatbread topped with pulled pork sautéed in a chipotle sauce topped with Korean BBQ sauce and melted marble cheese); Fox and Fiddle has stepped up their menu! 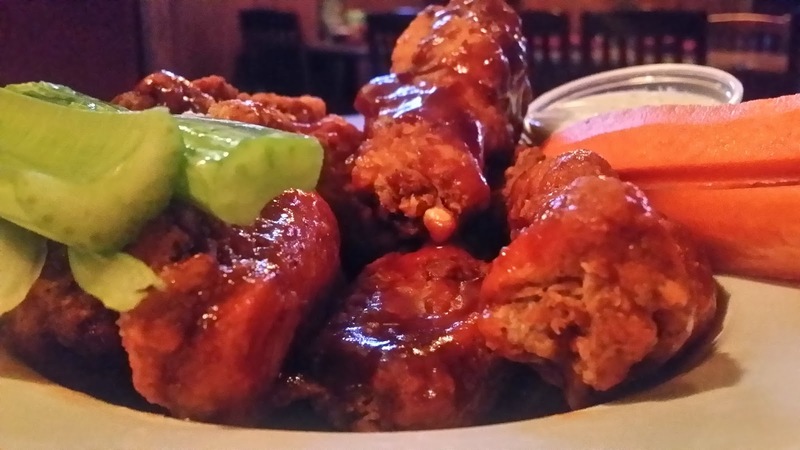 1lb Wings – Half with Whiskey BBQ sauce, half with Medium sauce. The wings were MASSIVE, seriously. I’m a bit of a chicken wing snob connoisseur, and I loved these wings. The Whisky BBQ sauce was very tasty, but I’m a sucker for hot wings! 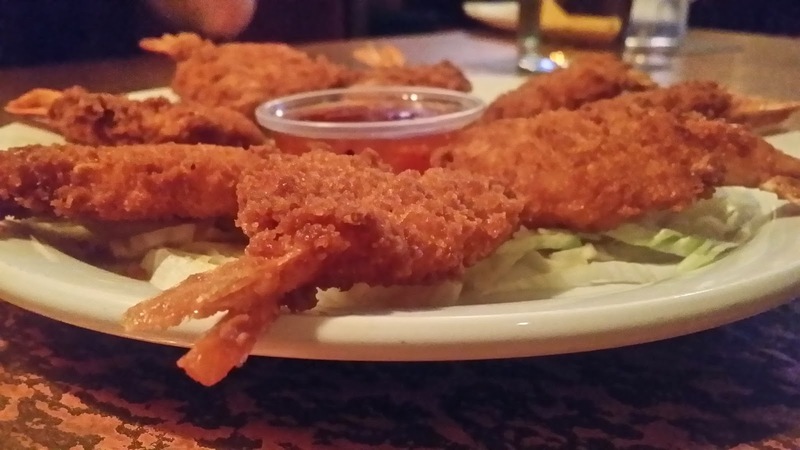 Crispy Shrimp – These shrimp were exactly as described. Crispy! Perfectly cooked and the sweet chilli sauce was a perfect companion. Pulled Pork Flatbread – The picture does not do this dish justice! 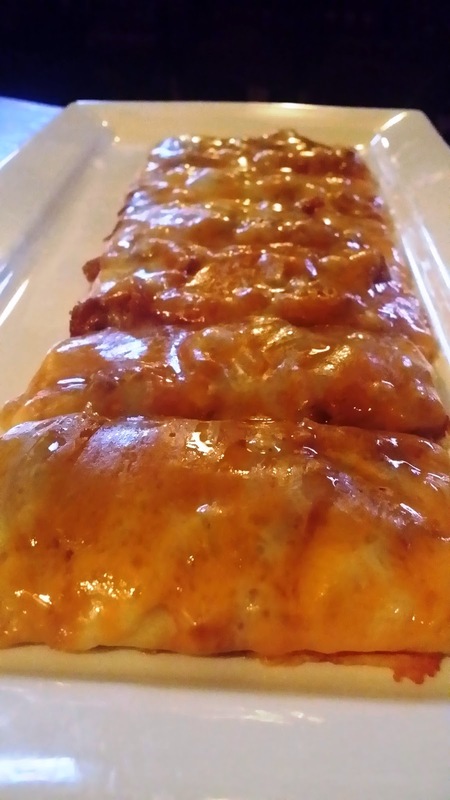 Cheese was melted and smothered over a mix of pulled pork sautéed in a chipotle sauce, I couldn’t stop eating it! 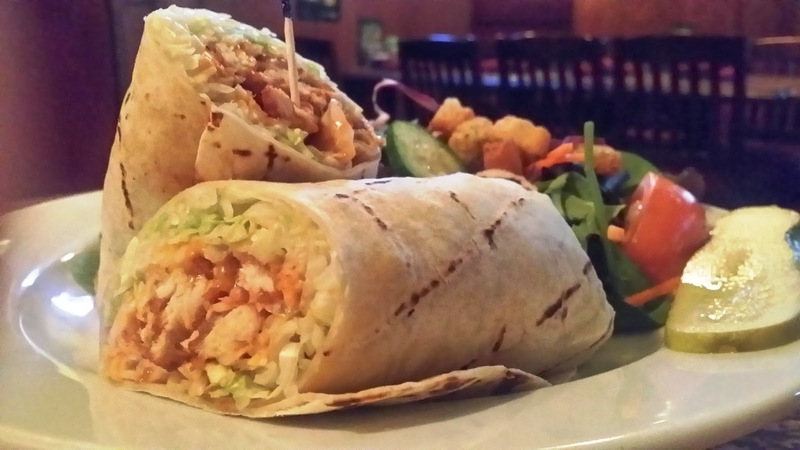 Chipotle Chicken Wrap – When this dish came out we were in shock at how large the wrap was. I’m not sure if it seemed so big because in reality it was, or if it was just because we were stuffing our faces with so much food already! LOL! I personally didn’t try this item, but I was told it was quite tasty and worthy of a re-order upon our next visit. 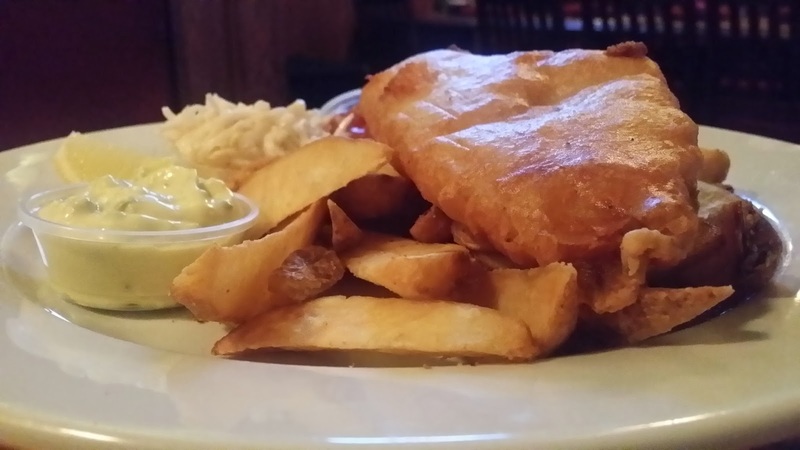 Fish and Chip – This is not only a pub favourite, but a personal favourite. The batter wasn’t too heavy and oily, which was nice. And the chips were perfectly cooked with a little crisp. Now it’s your chance to head into a Fox and Fiddle location and try out there new menu, as well as get some SWAG! AwesomeJennJenn.com has teamed up with Fox and Fiddle and Molson Canada to put together a swag bag giveaway for you! You can get a Molson Canadian duffle bag, a Molson Canadian hat and a Fox and Fiddle gift card (valued at $25)! Simply enter using the options below! Good luck! Disclaimer: My food was covered during this visit, alcohol was not. As usual - I am honest in what I write, and the wings really were as big as my face!